Tessa Lummis, registrar of the George Washington University Museum and The Textile Museum, sometimes feels as if she’s sitting on buried treasure. The museum’s 21,000-item textile collection is so vast that most of it has to be stored at the Avenir Foundation Conservation and Collections Resource Center on GW’s Virginia Science and Technology Campus. Only about 8 percent of the collection has ever been digitally photographed in high resolution. 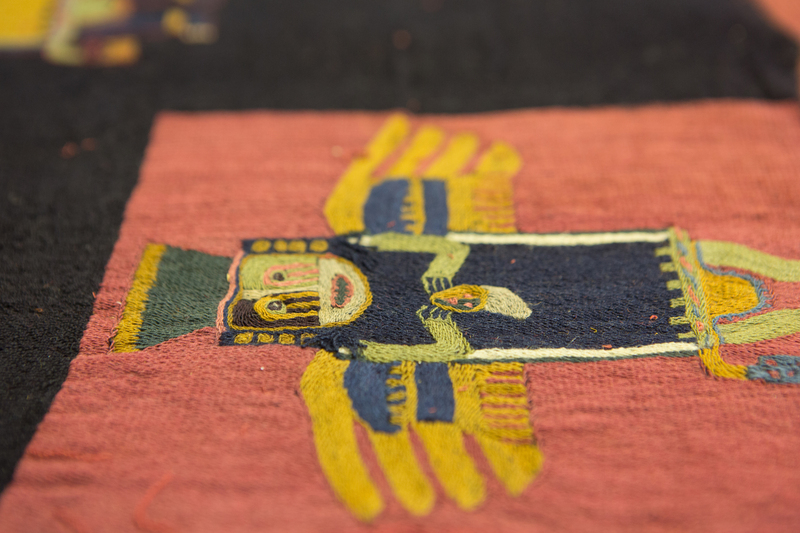 And those include many pieces too fragile or sensitive to display, including pre-Columbian pieces from Peru that have retained their vivid colors for nearly a millennium. Fortunately, much more of the museum’s vast holdings will soon be accessible to an international scholarly and artistic audience. The George Washington University Museum and The Textile Museum recently received a $249,961 grant from the Institute of Museum and Library Services in support of their existing intiative to create a publicly accessible digital collections database., With that funding, the museum aims to add high-resolution photography and comprehensive object data for an additional 25 percent of the collection and create opportunities for students to train for future museum careers. Photographing the objects is just one part of digital archiving, but even that is no simple process. The Avenir Center space is multi-use, so any photography project set up there has to be easy to disassemble. But careful lighting is required to illuminate an object without damaging it. Getting comprehensive photographs, particularly of a large object, can involve complex camera setups involving a catwalk or portable boom. And while Ms. Lummis said she and her team have been able to do short-term archival projects that allowed them to experiment with equipment and setup, there has been no funding for staff dedicated full-time to the project. The IMLS grant will provide the museum with funding to hire a full-time collections photographer, who will outfit the museum’s new photography studio and shoot high-resolution images of objects in the collections. It also funds the hiring of a student collections resident, tasked with assisting the photographer with art handling, and two student curatorial residents. They will assist in researching objects and compiling data previously accessible only in historic card catalogues and other physical files—including an object’s place and date of origin, measurements, style, material and technique—into the new digital MuseumPlus database. Records for six thousand textiles in the collection will be searchable through a publically accessible database by 2020. “It’s all about increasing access and exposure to a wider, more diverse audience,” she said. The grant funding runs from Oct. 1 of this year through the end of Sept. 30, 2020. One of Ms. Lummis’ first priorities has been working with curators to assemble a list of priority objects to be documented, including pieces of which researchers requested high-resolution images at times when her team was not able to provide them. She also said she is particularly excited to work with GW students on creating the museum’s new online presence.